Establishing a high-performing IT staff is a unique challenge because it requires the abilities to collaborate, motivate and listen all while working under fast-paced, dynamic conditions. Maintaining team satisfaction in this type of environment is a must. Why? Because satisfied employees make for positive performance which results in happy clients. In a tech-heavy field like managed IT services, it can be difficult to remember that our teams need a human element, but when we emphasize people, we all win. 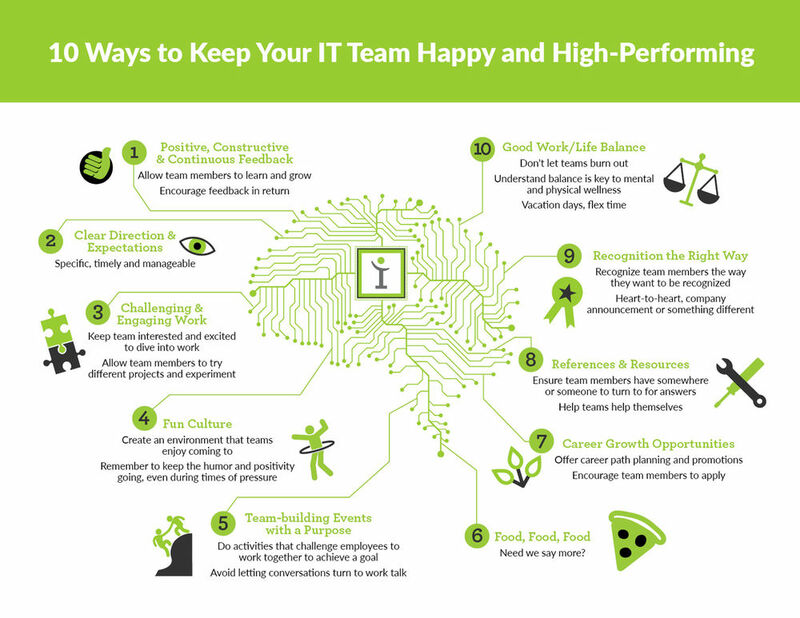 Follow these suggestions to ensure your IT team is feeling good and doing well. Be sure to click the image for a closer look! The happiness of our team is a top priority. Contact us today to discover the difference it makes to our employees and our clients. iVenture Solutions is an award-winning managed services provider delivering superior IT solutions to clients across Florida. As a leading-edge IT firm for small and medium-sized businesses, we provide a diverse range of services covering the entire scope of IT including maintenance, support, hosting and more. Through rapid response time, reduction of chaos and the right people, our certified team of IT professionals will fulfill your technology needs. At iVenture, we give you more time to do what matters most.